There is power in numbers! 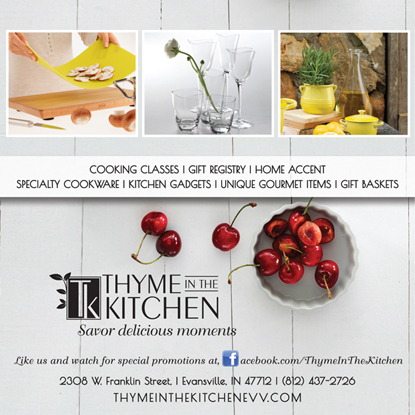 To help get the word out of their opening Thyme in the Kitchen of Evansville IN chose to do a series of magazines advertisements in Evansville Living Magazine. All together there were 3 run in the series. Instead of running the same ad 3 times we wanted to take advantage of each audience by designing and running 3 different advertisements, each featuring a different service. The first of the 3 magazine advertisements features 3 groups of products they sell and host cooking classes with. I’ve also included a list of all their services. Each image was carefully selected and placed on what could be your kitchen table or a picnic table background to provide a casual elegance feel. The second magazine advertizement for the Evansville Living series was designed for their bridal edition. This design was focused on providing brides with another option for gift registry! 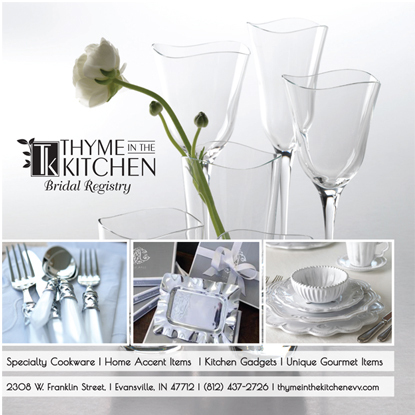 Again, maintaining the same square ad shape, black logo with ‘White’ background, to help the reader associate the ads with my client, Thyme in the Kitchen. 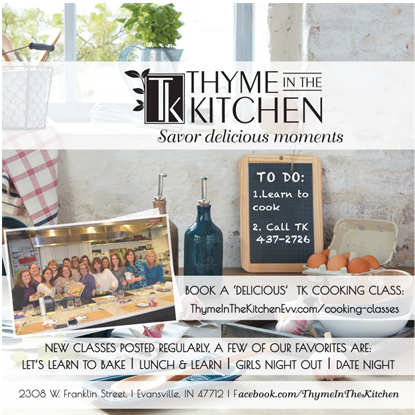 The third and final magazine advertisement for the Evansville Living series was focused on their cooking classes. This design was run in the spring so the warm kitchen backdrop with a touch of green herbs was the perfect setting. Featuring a group shot of one of their classes, I tied together their wished sentiment, All are welcome to come ’Savor Delicious Moments’ in our kitchen!